Neurochemistry is one of the most explosive areas of biological research. Scientists are now starting to unravel the molecular bases for memory, cognition, emotion, and behavior. The next decades will bring truly revolutionary understanding of brain chemistry and along with it the potential to alter human mood, memory, and to treat mental illness such as schizophrenia much more effectively. The human brain, with about 100 billion neurons (each which can form connections - synapses - with 1000 to 10,000 other neurons ) and associated glial cells (10-50 times the number of neurons) can be considered one of the most complex structures in the universe. This section will explore the biology and chemistry of neurons. where PX is the permeability of ion X. This treatment recognizes the importance of thermodynamics (chemical and electrical potentials) and kinetics (permeability coefficients). Remember this potential would not be possible if the ion gradient was not maintained by Na/K ATPase. How can the two essential features of the K+ channel pore - selectivity for the larger potassium ion over the sodium ion, and the near diffusion-limited rate of potassium ion flux through the channel be reconciled? Figure: Electrostatics of the K+ channel . The selectivity filter is composed of many stacked rings of oxygens that can interact with a dehydrated K ion but not with a dehydrated Na ion which can not approach close enough to form significant interactions. Surrounding the filter are twelve aromatic amino acids which constrain the size of the pore opening. The interactions of the filter O's with the K ion makes up for the energetically disfavored dehydration of the ion. The filter contains two K ions which repel each other, assisting in the vectorial discharge of the ions through the membrane. These ions must form weak interactions with the selectivity filter. The actual pore is mostly hydrophobic, which facilitates flow-through of the ions. The central cavity of the pore can hold some waters molecules in addition to the K ions which helps stabilize the ion in the middle of the pore. In another recent paper (Nature, 404, April 20, 2000, 881-884), molecular dynamic calculation were performed to distinguish between various models for binding and selectivity of the channel. They found the favored conduction pathway arises from conformational changes between 2 discrete shapes that differ in energy by only about 5 kcal/mol (about 1-2 H bonds). The picture below shows the channel with one of the 4 subunits removed for clarity. Water is shown in red and the K ions in blue. Two ions are in the filter and one in the middle cavity. 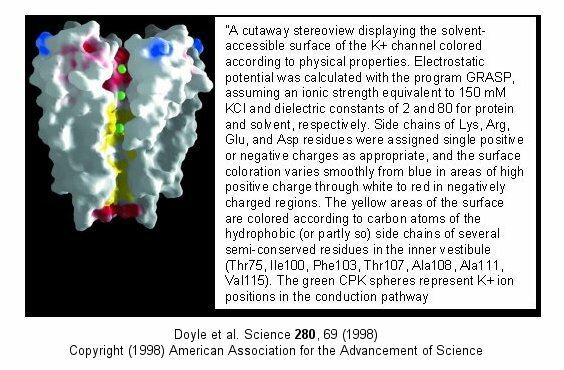 MacKinnon's laboratory (2003) has recently determined the X-ray structure of a voltage-dependent K+ channel from Aeropyrum pernix, an archaebacteria. This protein is homologous to eukaryotic K+ channels. This membrane protein was solubilized with detergent and crystallized in the presence of an antibody which inhibited the flexibility of part of the protein, facilitating the formation of crystals. Like the sodium channel, this protein has 4 subunits each consisting of a 6 alpha-helices which cross the membrane. The S4 helix, which has multiple positively charged side chains, is present in each subunit and acts as a voltage sensor. It was presumed that the helices would would twist in a ratchet-like fashion, leading to the movement of positive charge in the S4 helix across the membrane (as described above for the Na channel). MacKinnon's group found evidence for another mechanism for voltage sensing. Crystal structures show that the S4 helices is imbedded in the membrane, and is not interacting directly with other parts of the protein. It forms an alpha-helical haripin (a paddle shape) which can move through the membrane on change of the transmembrane potential. The topological disposition of paddle (within the membrane) explains the effect of small, lipophilic molecules (like anesthetics nerve toxins, insecticides like DDT) on the channel. His group also labeled the S4 helix with a biotin-17 angstrom linker complex. On change of the transmembrane potential the biotin flips from across the membrane where it can bind to (and be detected by) its natural binding partner, avidin. The authors suggest that the "voltage sensitive paddles operate somewhat like hydrophobic cations attached to levers, enabling the membrane electric field to open and close the pore." Channels, once open, must be inactivated. In the case of the voltage-gated potassium channel, inactivation occurs when the amino-terminal cytoplasmic domain binds to the potassium pore on the cytoplasmic side, in interaction likened to the binding of a "ball on a chain" (the cytoplasmic domain) to the pore opening. The chain acts to tether the ball domain so it may swing to bind to the pore opening. The ball domain contains both positively charged and hydrophobic regions. Where is the ball domain in the absence of inhibition? Recent studies (Oliver et al.) have shown that a positive domain can bind to proximal phosphatidyinositol 4,5-bisphosphate (PIP2) lipids on the inner leaflet of the membrane bilayer. When so bound, inactivation of the channel is prevented. As you will see in the next section, PIP2 can also be cleaved to form diacylglycerol and inositol 1,4,5-trisphosphate when cells are activated byexternal factors (hormones, growth factors, etc) in the process of signal transduction. The latest (2005) new structure (Long et al) from MacKinnon's group of the another eukaroytic K+ channel (in its open state) is more consistent with previous expectations. 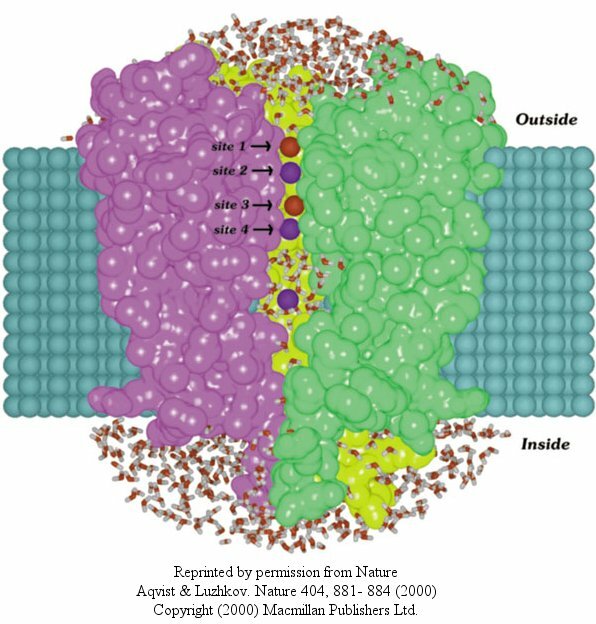 Instead of using antibodies to stabilize the voltage-sensor domains, they crystallized the physiological channel, which in eukaryotes consists not only of 4 identical membrane spanning subunits, but also an addition domain T1 and another protein, beta. The T1 domain consists of the N terminal regions preceding the first membrane-spanning helix, S1, of each of the four monomers of the channel and is located intracellularly at the entrance point of the channel. Four conserved Arg resides on S4, part of the voltage-sensor domains, are hypothesized to move under the influences of forces arising from changes in the membrane's electric field initiated by ion movement through other ion channels in the membrane. Mechanical work is done by the electric field on the voltage sensor as the charged Arg residues are moved through the electric field and the protein conformation is altered. In turn, the S4 and coupled S5 helices of the voltage sensor do mechanical work on the pore by altering its conformation to open/close the pore, specifically at the activation gate of the pore. This seems quite similar to how iron movement into the heme plane in hemoglobin on oxygenation pulls the proximal His on the F8 helix which then transmits a conformation change to other helices in the subunit, leading to cooperative conformational changes in the tightly packed protein. Two of the Arg residue on the S4 sensor are facing the lipid interface while the other two are buried in the voltage-sensor domain. Their work shows that this domain is clearly separate from the pore domain, much as the extracellular ligand-binding domain of neurotransmitter-gated ion channels are separated from the pore domain. In this case, however, the voltage-sensor domain is buried in the membrane. Alterations of potasium channels has recently been implicated in the inhibitory effects of ethanol. Davies, McIntire, et al. studied effects of ethanol on the round worm C. elegans, believing that alcohol-mediated inhibition of neural activity would be conserved across species. Previously it has been shown that the dose-effect curves for behavioral changes is similar for both invertebrates and vertebrates. Ethanol seems to affect many different proteins that would lead to synaptic inhibition, including GABA and glutamate channels and potassium channels. Many different gene products (dopamine D4 receptors, protein kinase C) are associated with increased sensitivity while others (nitric oxide synthase, dopamine D2) are associated with ethanol resistance. These changes suggests the complex pathways are involved in ethanol effects but don't isolate a specific target for its effects. When C. elegans were exposed to ethanol for brief time periods, ethanol levels rose to values similar to levels seen in intoxicated drivers (0.1%). 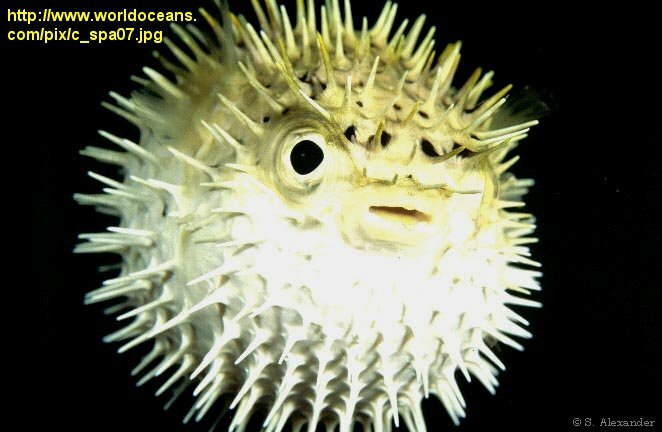 They isolated mutants that were resistant to ethanol effects (changes in movement and egg-laying behavior). These mutants affected a single gene, slo-1, homologous to the the slowpoke gene in drosophila. The gene in both organisms encoded a BK potassium channel, whose normal function is to repolarize neural membranes. Mutants strains, when transformed with slo-1+ regained ethanol sensitivity. Ethanol appears to directly activate the channel. This would lead to efflux of potassium ions from the worm, hyperpolarizing the neural cells, leading to inhibition of neural activity. Effects in C. elegans were observed at physiologically relevant ethanol, ranging from those that produce euphoria to sedation in humans. The main inhibitory neurotransmitters are GABA (gamma-aminobutyric acid, which is made from Glu through decarboxylation of the α-C group) and glycine. The bind to transmiitter-gated chloride channels, which when open hyperpolarize the membrane. Benzodiazepines (like Valium and Librium - anti-anxiety and muscle-relaxing agents) and barbituates (like phenobarbital-hypnotics) bind at allosteric sites and potentiate the binding of each other and GABA. if the two species move through different channels in a sequential fashion (which generates an action potential) if the ions are potassium and sodium). In summary, ligand and voltage gated channels allow changes in the polarization of the membrane. Other mechanisms can also lead to changes. Membrane proteins can be phosphorylated (using ATP) by protein kinases in the cell, leading to a change in the conformation of the membrane protein, and either an opening or closing of the channel. Channels linked to the cytoskeleton of the cells can also be opened or closed through stretching. Other stimuli that gate channels are light (through photoisomerization-induced conformational changes), heat, and cold. Animation: Comparison of direct and indirect neurotransmitter actions, ligand-gated vs. G-protein-coupled receptor. Long, S. B. et al. Crystal Structure of a mammalian voltage-dependent Shaker family K+ Channel. Science 309, 897 (2005); Long, S. B. et al. Voltage Sensor of KV1.2: Structural Basis of Electromechanical Coupling. Kandel et al. Principles of Neural Science, 3rd edition. Elsevier (1991). This is the source for much of the material in this section.